There is amazing new challenge Inspired by.... over at A Blog Named Hero. I think all of the artists are amazing, but I picked Jennifer McGuire, since I still remember the first time I came across her blog. I just started cardmaking then and I couldn`t believe someone can make such beautiful cards. I am still inspired by her talent and also very sweet personality, so I tried to capture her cute and elegant style with this `We`ve moved` card. 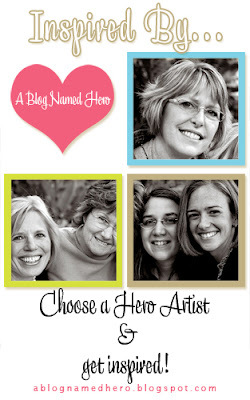 You are invited to check all the other gorgeous cards on the A Blog Named Hero. 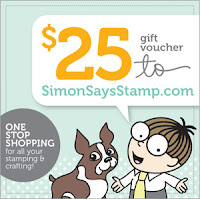 I hope you will join the challenge, since Simon Says Stamp is our generous sponsor and one lucky winner will recieve the 25$ gift certificate. 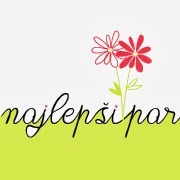 Pa je mesec naokoli in že je tu nov izziv pri A Blog Named Hero - Inspired by... Narediti je potrebno voščilnico (ali kaj drugega), za katero navdih ste dobile pri eni izmed HA ustvarjalk. Mene je pred leti Hero Arts očaral tudi zaradi izjemno prijaznih ljudi, ki delajo zanje in jaz sem inspiracijo za tokratni izziv našla pri Jennifer McGuire. Upam, da se boste udeležile izziva in z malo sreče dobile darilni bon za 25$ pri Simon Says Stamp. Super ideja in izbrala si krasno barvo. So love the colors and the design is AWESOME ... LOVE this card!!! Tina, you did such a great job!!! WOW! This is simple but STUNNING! The color combo is such an eye catcher and you really let the stamps shine, plus that ribbon, shut the front door! Gorgeous!! Krasno. Take hiške v vrsti so mi vedno všeč. Tvoja zamisel o selitvi pa je enkratna! Sem se prav nasmejala. oh, what a cute card! Love it!